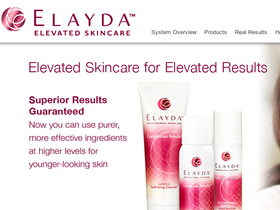 Shop at Elayda Skincare, online at ElaydaSkin.com, for professional skincare that's also affordable. Elayda was created by the former President and CEO of both Revlon and Neutrogena in an aim to provide easy to use skin care that's more accessible and less expensive. Elayda Skincare offers products which repair and build healthy skin, and offers a product line which includes hydrating cleansers, nourishing creams, eye lifting creams, products designed to smooth fine lines and even skin tone,UVA/UVB protection, brighteners, and more. ElayaSkin.com is a great place to shop for beauty products designed to make you feel and look your best. But before you shop, be sure to get all the latest ElaydaSkin.com promotions, Elayda Skincare discounts, and Elayda Skincare coupon codes found here at RetailSteal.com. Elayda Skincare ships within the Continental United States via UPS Basic or UPS 3 Day. Elayda Skincare ships products (with the exception of their foam formulas) via USPS Priority to AK and HI. See site for more information. Get the Continuous Results 3-Piece System, for only $39.95 per month supply. Offer includes 2 free bonus gifts. Click here to shop.